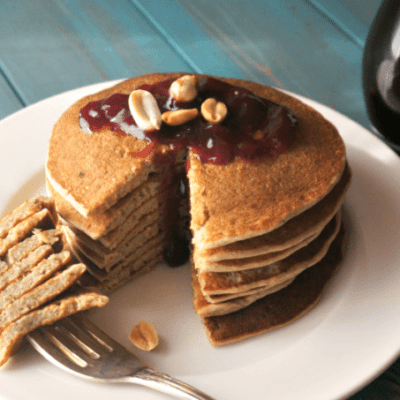 These peanut butter and jelly pancakes are irresistible! Gluten free pancakes are made with a hefty dose of peanut butter and topped with grape "jelly" syrup. Preheat a greased skillet/griddle to medium heat. Dump oatmeal, milk, baking powder, vanilla, cinnamon, peanut butter and bananas into your blender and give it a whirl until everything is combined and oats are blended well. I like these pancakes thicker, but feel free to add a bit more liquid if desired. For the Syrup: Whisk the juice and corn starch together on medium heat until thickened, about 10 minutes. Serve with pancakes immediately (if using later, heat the syrup up again).